News and current events at the Centre. Click here to download the latest issue. Teams of up to 6 persons at £5 per head bookable in advance. 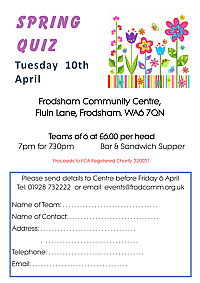 Drop Sue an email at events@frodcomm.org.uk giving the name of your team. The entry fees will be collected on the night. Sandwich supper provided. Licensed bar. Click on the thumbnail to download more details and an entry form. Fashions from Eve and Love Frocks with attractive models to show the clothes at their best. Strawberries and a Complimentary glass of Pimms on arrival. Licensed bar with waitress service. Click on the the thumbnail to download more details. Entry by ticket only £8.00 per person available from Dandelion Gifts, Eve, the Community Centre Box Office and online by clicking on the Buy Now button and paying by Credit/Debit card or Paypal. Numbers are limited so Buy Now and reserve places for yourself and your friends! Your tickets will be available for collection from the Community Centre Box Office Monday to Thursday 8.30am to 8.00pm, Friday 8.30 to 4.30pm and Saturday 8.30 to 12.30pm. Please allow at least 2 working days between ordering and collection. Access to the field for Sellers from 7.30 am. Outdoor pitches £10 per car or £14 per Van or Trailer. The main hall is being used for rehearsals so there are no indoor pitches this year. Open to Buyers 8.00 am. A not to be missed event with rooms full of bargains. All donations of jumble are welcomed and we can arrange collection. 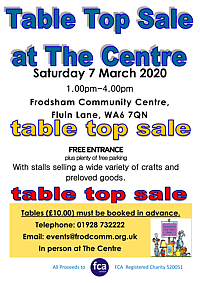 Please contact events@frodcomm.org.uk or phone the Centre on 01928 732222 or Sue on 07971 907669 to arrange collection or you can bring your donated items to the Centre during the last week in May 9.00am to 4.00pm. Doors will open at 9:30am at Frodsham Community Centre with an entrance charge of only £1.00 (under 12s get in free). Click on the thumbnail to download a flyer. Come along and grab a bargain! Tables (£10.00) must be booked in advance. Entrance only £1.00, under 12s free. 40 stalls with a wide range of goods. Doors open at 7.00pm with the quiz starting at 7.30. Each team should have 6 members at £5 per head. The quiz will consist of 10 rounds of 10 questions to be answered by the team in writing. The Centre Bar will be open all evening with a sandwich supper supplied in the interval. Dance away the winter blues with the Flaxmere Ceilidh Band. Don't worry if you don't know all the dance steps. Our expert caller will guide you through it! The Centre Bar will be open all evening with a Scottish Supper served during the break. Download a poster here and tell all your friends. Tickets cost £15.00 for adults or £7.00 for under 12s, available at the Centre Box Office, Dandelion Gifts in Church Street or on-line here . Most Debit/Credit cards and Paypal are accepted for payment. Charity Caberet Evening in aid of Halton Haven Hospice, Motor Neurone Association, and Medcare. Live Band, Dancing and Great Entertainment including the fabulous Copa Dancers & Singers. “Latin heat and fun at The Copa”. CLOTHING AVAILABLE TO TRY ON & BUY! 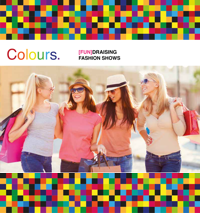 Raffle: FABULOUS prizes to be won at the show! Click on image to download a flyer. (Soft drinks are also available). Tickets are available from Dandelion Gifts, Church Street and Frodsham Community Centre. This was a very popular event last year and tickets are limited so get yours soon! 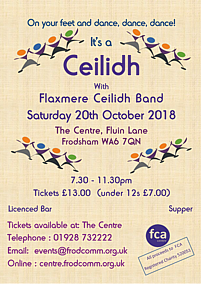 Dance away the Autumnal blues with the Flaxmere Ceilidh Band. Tickets cost £13.00 for adults or £7.00 for under 12s, available at the Centre Box Office, Dandelion Gifts in Church Street or on-line here. Most Debit/Credit cards and Paypal are accepted for payment. 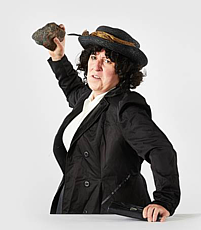 Wrong ‘un tells the adventurous story of Annie Wilde, a Lancashire mill-girl galvanised by a rousing mixture of injustice, conviction, self-doubt and fear on her journey from schoolroom to prison cell and beyond. A punchy musical drama that draws on class, privilege, hope and disappointment in wartime England. February 1918, and after several decades of protest and four years of bloody war, Parliament is poised to grant what the suffragettes have demanded and fought for – votes for all women. After years of direct action, arrest, imprisonment and force-feeding, it seems their time has come. A one-woman suffragette musical written by Boff Whalley and directed by Red Ladder’s Artistic Director Rod Dixon, starring Kathleen Yore. Tickets will cost £10.00 with concessions at £8.00 for students and over 60s, available at the Centre Box Office, Dandelion Gifts in Church Street or on-line here (booking fees apply). Suitable for over 12s. The Centre Bar will be open and there will be a question and answer session after the interval. Back by Popular Demand, the Centre's Table Top Sale. Entry only £1 with accompanied children free and the Centre Café will be open for hot and cold drinks and snacks. We expect over 40 tables with a wide variety of goods for sale. There are sure to be lots of bargains to be had. For sellers the cost is £10 per table booked in advance. The Centre will be open from 12 noon for setting up the tables. 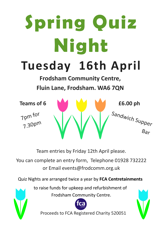 Book your Table(s) by phoning the Centre on 01928 732222, drop in to the Centre or email events@frodcomm.org.uk. 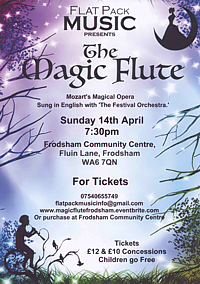 Come and watch Flat Pack Music's production of Mozart's The Magic Flute in English with 'The Festival Orchestra' at Frodsham Community Centre. Founded by conservatoire trained musicians Flat Pack Music is a not for profit company which aims to bring professional opera to people that due to cost or location would not otherwise have access to it. Based in the North West of England they work to provide concerts, musical themed events, and operas. Book your tickets now £12.00 and £10.00 Concessions. Children go Free. Visit: www.magicflutefrodsham.eventbrite.com for on-line sales (booking fees apply). 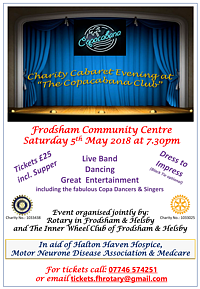 Tickets are also on sale at Frodsham Community Centre on the night. Just come along. The doors open at 7.00pm. The quiz starts at 7.30pm Teams of 6 at £6 per head (collected in the interval) 10 rounds of 10 questions answered by each team in writing. Bar open all evening and sandwich supper in the interval. Team Prizes and a Trophy for the winning team. Click on the poster thumbnail to download an entry form. The doors open at 7.00pm and the fashion shows starts at 7.30pm. Complimentary glass of Prosecco on arrival. Entertainment includes Raffle with Fabulous Prizes and Centre Bar. or Dandelion Gifts, Church Street, Frodsham. 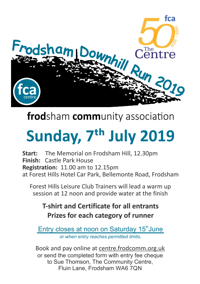 The run will start at the Memorial on Frodsham Hill at 12.30pm and will finish in front of Castle Park House, a distance of approximately 1.3 miles. All comers are welcome in this fun run, from under 11s to over 60s, and all runners will get a tee shirt. Prizes will be awarded to the first home in each category of runner. If you prefer, you can download the entry form as a pdf by clicking on the thumbnail image above right. This document contains more information about the run and gives details of the conditions for entry. A complete list of all the runners with their run category and allocated run numbers will be made available during May and June. In previous years demand has been brisk and we have been obliged to close entry by mid June. Thank you for your interest and don't forget there are a lot more attractions at Festival in the Park where the run finishes. We hope to see you there.